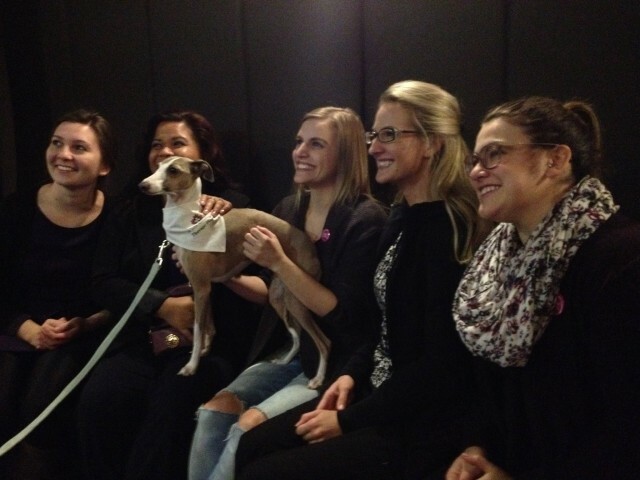 Student volunteers from BU's Psychiatric Nursing Program (Winnipeg campus), pose with one of the therapy dogs in attendance at a special movie screening. Faculty, staff and students from Brandon University helped organize a special film screening in Winnipeg earlier this month in support of youth mental health. Held at the Park Theatre, the event included an exclusive screening of To Write Love on Her Arms, a Sony Pictures film that wasn’t originally released to theatres in Canada. The film was followed by a panel discussion centred on young people’s experiences of mental illness and their needs regarding support and services for mental well-being. About 150 people, both youth and adults, attended the Nov. 12 event, and many took an active part in the post-film discussion on this important topic, which all-too-often remains stigmatized while those affected suffer in silence. Volunteers with trained therapy dogs from St John’s Ambulance also attended, giving film-goers a chance to experience this increasingly popular mental-health support service. Debra Dusome, an Assistant Professor in BU’s Psychiatric Nursing program, chairs the Winnipeg Community Action Team for the Canadian nonprofit group Partners for Mental Health, which presented the event. Michelle Magnusson, BU’s Student Accessibility Services Coordinator, was among those who took part as a panelist. The Winnipeg Community Action Team also includes BU Sociology instructor Kristen Hardy, and two first-year Psychiatric Nursing students, Eline Paisley and Danielle Spear. A group of five fourth-year Psychiatric Nursing students – Monica Carranza, Megan Dooley, Jessica Heino, Tara Nassar, and Serena Yaworski – participated as well, acting as support persons for attendees.